RotoRingTM Series rotary actuators provide superior angular positioning and are designed to eliminate backlash, friction and wear problems associated with worm, gear and belt drives. Radially distributed RotoLinearTM motoring modules provide high positioning stiffness during rotary indexing and when installed on moving XY tables. These rotary tables provide unlimited rotation and are capable of precise positioning and velocity controls when used with micro-stepping drives. Can also be equipped with IntelLiCoder feedback for closed loop operation. 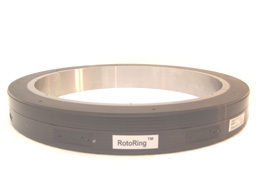 RotoRingsTM rotary tables can be mounted in any orientation and have "large open center design". When used in processing 12" semiconductor wafers, every area of the wafer can be accessed. In general automation applications large open center offers the opportunity to access parts from inside and outside of the table simultaneously. This feature allows robotic devices, pick and place and ancillary tooling to be mounted inside the table, saving floor space and reducing parts handling with increased productivity. See also ServoRing™ Series rotary tables for high capacity high speed rotary table applications.